Gene editing, or genome editing with engineered nucleases is a type of genetic engineering in which DNA is inserted, deleted or replaced in the genome of an organism using engineered nucleases, or "molecular scissors." These nucleases create site-specific double-strand breaks (DSBs) at desired locations in the genome. The induced double-strand breaks are repaired through nonhomologous end-joining (NHEJ) or homologous recombination (HR), resulting in targeted mutations ('edits'). To understand these concepts you need to understand the concept of DNA double stranded break (DSB) repair mechanisms. Two of the known DSB repair pathways that are essentially functional in all organisms are the non-homologous end joining (NHEJ) and homology directed repair (HDR). NHEJ uses a variety of enzymes to directly join the DNA ends in a double-strand break. In contrast, in HDR, a homologous sequence is utilized as a template for regeneration of missing DNA sequence at the break point. The natural properties of these pathways form the very basis of nucleases based genome editing. NHEJ is error-prone, and has been shown to cause mutations at the repair site. Thus if one is able to create a DSB at a desired gene in multiple samples, it is very likely that mutations will be generated at that site in some of the treatments because of errors created by the NHEJ infidelity. On the other hand, the dependency of HDR on a homologous sequence to repair DSBs can be exploited by inserting a desired sequence within a sequence that is homologous to the flanking sequences of a DSB which, when used as a template by HDR system, would lead to the creation of the desired change within the genomic region of interest. Despite the distinct mechanisms, the concept of the HDR based gene editing is in a way similar to that of homologous recombination based gene targeting. However, the rate of recombination is increased by at least three orders of magnitude when DSBs are created and HDR is at work thus making the HDR based recombination much more efficient and eliminating the need for stringent positive and negative selection steps. So based on these principles if one is able to create a DSB at a specific location within the genome, then the cell’s own repair systems will help in creating the desired mutations. Creation of a DSB in DNA is easy by using restriction enzymes. However, if genomic DNA is treated with a particular restriction endonuclease many DSBs will be created. This is a result of the fact that most restriction enzymes recognize a few base pairs on the DNA as their target and very likely that particular base pair combination will be found in many locations across the genome. To overcome this challenge and create site-specific DSB, three distinct classes of nucleases have been discovered and bioengineered to date. 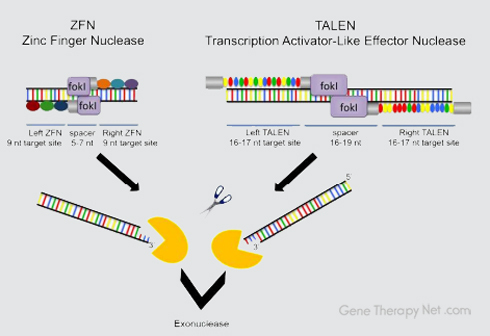 These are the Zinc finger nucleases (ZFNs), transcription-activator like effector nucleases (TALEN) and meganucleases. The concept behind ZFNs and TALEN technology is based on a non-specific DNA cutting enzyme, which can then be linked to specific DNA sequence recognizing peptides such as zinc fingers and transcription activator-like effectors (TALEs). The key to this was to find an endonuclease whose DNA recognition site and cleaving site were separate from each other, a situation that is not common among restriction enzymes. Once this enzyme was found, its cleaving portion could be separated which would be very non-specific as it would have no recognition ability. This portion could then be linked to sequence recognizing peptides that could lead to very high specificity. Figure 1. Overview of ZFNs and TALEN technology. Gene targeting through ZFNs or TALEN-based approaches can also be used to modify defective genes at their endogenous chromosomal locations. Examples include the treatment of X-linked severe combined immunodeficiency (X-SCID) by ex vivo gene correction with DNA carrying the interleukin-2 receptor common gamma chain (IL-2Rγ) and the correction of Xeroderma pigmentosum mutations in vitro using TALEN. Insertional mutagenesis by the retroviral vector genome induced leukemia in some patients, a problem that is predicted to be avoided by these technologies. However, ZFNs may also cause off-target mutations, in a different way from viral transductions. Currently many measures are taken to improve off-target detection and ensure safety before treatment. Sangamo BioSciences (SGMO) introduced the Delta 32 mutation (a suppressor of CCR5 gene which is a co-receptor for HIV-1 entry into T cells therefore enabling HIV infection) using Zinc Finger Nuclease (ZFN). Researchers at SGMO mutated CCR5 in CD4+ T cells and subsequently produced an HIV-resistant T-cell population. One avenue of exciting research involves the generation of custom immune cells with modifications of interest. Similarly, scientists at Cellectis generated custom T-cells expressing chimeric antigen receptors using TALEN® technology. These T-cells can be engineered to be resistant to anti-cancer drugs and to invoke immune responses against targets of interest.